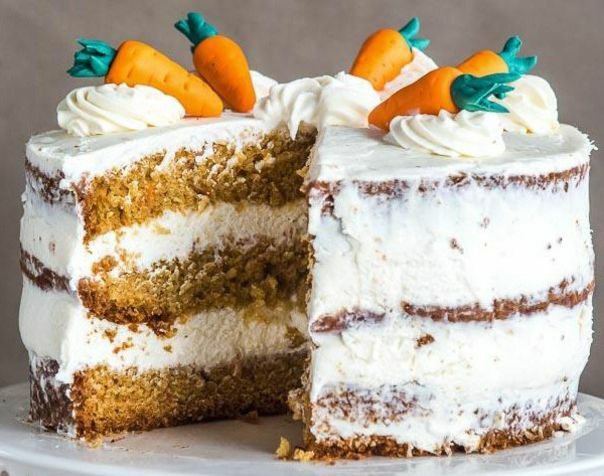 Very aromatic, with a good dense cake (by the way, they are very large pores, which quickly filled with cream), a pleasant combination of sour cream and sweet (not sweet) cakes. Zest and juice of orange — 1 PC. 1. Grate two large, three medium or slide the tiny carrots and the zest of one orange. Finely chop the nuts. 2. In a bowl mix sugar and eggs and beat with a mixer for 3 minutes. Mass will increase in volume and become lighter. Then add the butter. Again mix well. 3. At the same time in a separate bowl, mix the flour and dry ingredients with a whisk for 1 minute. 4. Gradually add the dry ingredients to the batter, stirring carefully. There may be so that the dough is rolled into balls, you will feel that it is completely dry. 5. Add the carrot and nuts. Here are already stirred will only shovel. In the end, the dough should be thick. Add a couple tablespoons of orange juice. Do not overdo it! The mixture should be very thick. 6. Prepare the cakes. From this quantity of dough you can make three layers for 16 cm and two 18 cm in diameter. Lubricate the form of butter (thin layer), sprinkle a pinch of flour and shake. The whole inside will be covered with dust. Excess shake. This technique is called «French shirt» and very comfortable — the cakes themselves out of shape after baking. 7. Bake at 180°C. the Time depends on the shape — 16-inch cakes are prepared 22-25 minutes. A large cake can be prepared 35-50 minutes. Readiness can be defined using a dry toothpick. If you want the cake turned out really delicious, keep for 3-5 minutes longer. Finished cakes remove from the mold, invert and cool on wire rack. 8. Prepare the cream. If you are in the thick sour cream, decant the excess moisture through a cheesecloth for a couple of hours. Whisk sour cream, honey, sugar and put in the refrigerator prior to treatment. When all three cake has cooled, rub every cream and assemble the cake. If you plan to treat them guests from Boca also apply the cream to not zavetrilos.